Currently, Allegheny Boxer Club has 12 active members. Membership is open to all Boxer fanciers 18 years of age and older. Junior membership is available to those between the ages of 10 years to 17 years of age. The membership process consists of completing an application, payment of dues, endorsement by two current members in good standing, and attendance at two meetings. All applicants must attend two meetings to have their application read and voted upon before being granted official membership. Membership dues are payable by January 1st of each calendar year. So why become a member of Allegheny Boxer Club...? The benefits of membership are invaluable. You are guaranteed to make friends - both human and canine, learn something new, do something fun and challenging, and be able to participate in various activities - all related to boxers! 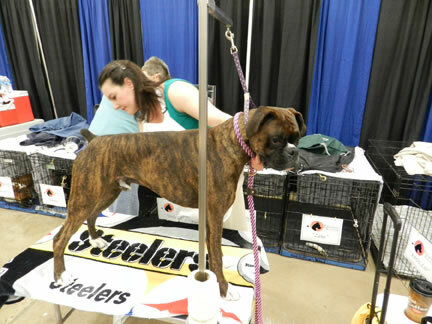 The club holds specialty shows every year during the Memorial Weekend Cluster in New Castle, PA, as well as The Steel Valley Cluster in Canfield, OH. Monthly meetings are held throughout the year. Membership applications are always being accepted and can be downloaded by clicking on the link below. Contact our membership chairperson Annette Mucci with any questions regarding the application process!